I'm not a big fan of unboxings these days. There's a lot of cardboard involved, and if shot incorrectly my hideous feet might get in the frame. 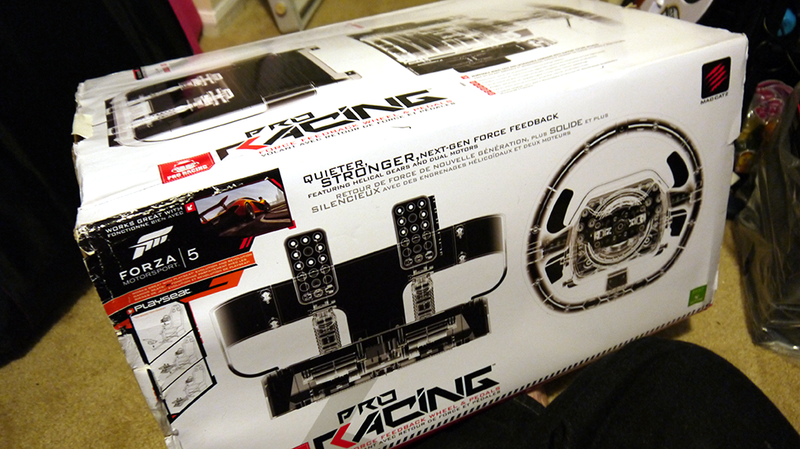 But in the case of Mad Catz' $400 Force Feedback Racing Wheel for the Xbox One, unboxing it on video was a necessity. Otherwise I might have left this giant box sitting on the floor of my office until late this month when Forza Horizon 2 comes out or worse — saving it until November's Project Cars. See, in order to remove this from its box, I'm also going to have to rearrange my entire office, disassembling several projects in order to utilize a table as a mount. "But Fahey, it comes with lap rests!" Screw lap rests in their stupid lap rest faces. So I unbox. Pardon the feet. I feel much better about things now. Now Mad Catz can stop worrying that I'd just sold it on eBay or something. Oh, and for the record, that's real suede covering the steering wheel. Makes me want to break out my old moccasin boots. I'll set this puppy up completely this week. Then I'll wait until the end of the month for Forza Horizon 2 to come out. In the meantime, you can read up on the wheel over at Mad Catz.